The Eden, NC area has had 9 reports of on-the-ground hail by trained spotters, and has been under severe weather warnings 57 times during the past 12 months. Doppler radar has detected hail at or near Eden, NC on 35 occasions, including 3 occasions during the past year. 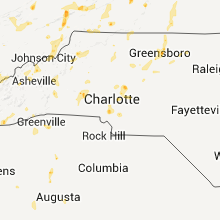 4/19/2019 3:05 PM EDT At 305 pm edt, a severe thunderstorm was located near kernersville, moving northeast at 50 mph (radar indicated). Hazards include 60 mph wind gusts and quarter size hail. Hail damage to vehicles is expected. Expect wind damage to roofs, siding, and trees. 10/11/2018 4:40 PM EDT At 439 pm edt, severe storms were located along a line extending from near halifax to near lawsonville, moving southeast at 5 mph (radar indicated). Hazards include 70 mph wind gusts. Expect considerable tree damage. damage is likely to mobile homes, roofs, and outbuildings. locations impacted include, danville, eden, reidsville, south boston, and wentworth. this includes the following location danville airport. A tornado watch remains in effect until 900 pm edt for north central north carolina, and central and south central virginia. 10/11/2018 4:11 PM EDT At 408 pm edt, severe thunderstorms were located along a line extending from halifax to near lawsonville, moving south at 40 mph (radar indicated). Hazards include 70 mph wind gusts. Expect considerable tree damage. Damage is likely to mobile homes, roofs, and outbuildings. 10/11/2018 4:06 PM EDT At 405 pm edt, severe storms were located along a line extending from near halifax to quick, moving southeast at 35 mph (radar indicated). Hazards include 70 mph wind gusts. Expect considerable tree damage. damage is likely to mobile homes, roofs, and outbuildings. locations impacted include, danville, eden, reidsville, south boston, and wentworth. this includes the following location danville airport. A tornado watch remains in effect until 900 pm edt for north central north carolina, and central and south central virginia. 10/11/2018 3:10 PM EDT At 308 pm edt, band of showers with damaging winds were located along a line extending from near turbeville to near camp springs, moving south at 35 mph (radar indicated). Hazards include 70 mph wind gusts. Expect considerable tree damage. Damage is likely to mobile homes, roofs, and outbuildings. 9/1/2018 4:55 PM EDT The severe thunderstorm warning for northwestern rockingham and south central henry counties will expire at 500 pm edt, the storms which prompted the warning have weakened below severe limits, and no longer pose an immediate threat to life or property. therefore, the warning will be allowed to expire. however heavy rain is still possible with these thunderstorms and flooding and/or flash flooding remains possible as the heavy rainfall continues. when it is safe to do so, please send your reports of hail of any size, as well as reports of any wind damage, including downed trees or large limbs, to the national weather service by calling toll free at 1, 8 6 6, 2 1 5, 4 3 2 4. reports and pictures can also be shared on the national weather service blacksburg facebook page and on twitter. remember, a flood advisory remains in effect for much of southwestern and southern henry county until 745 pm edt. 9/1/2018 4:42 PM EDT At 441 pm edt, severe thunderstorms were located along a line extending from near price to near sandy ridge, and are only drifting very slowly southeast at 5 mph or less (radar indicated). Hazards include 60 mph wind gusts and quarter size hail. Hail damage to vehicles is expected. expect wind damage to roofs, siding, and trees. Locations impacted include, eden, wentworth, mayodan, madison, and stoneville. 9/1/2018 4:27 PM EDT At 426 pm edt, severe thunderstorms were located along a line extending from just southeast of martinsville to ayersville, and are nearly stationary (radar indicated). Hazards include 60 mph wind gusts and quarter size hail. Hail damage to vehicles is expected. expect wind damage to roofs, siding, and trees. locations impacted include, eden, wentworth, mayodan, madison, and stoneville. This includes the following locations the martinsville speedway and martinsville airport. 9/1/2018 4:05 PM EDT The national weather service in blacksburg has issued a * severe thunderstorm warning for. northwestern rockingham county in north central north carolina. the city of martinsville in south central virginia. southeastern henry county in south central virginia. Until 500 pm edt. 8/8/2018 2:57 PM EDT At 243 pm edt, a severe thunderstorm was located near cascade, moving east at 30 mph (radar indicated). Hazards include 60 mph wind gusts and quarter size hail. Hail damage to vehicles is expected. Expect wind damage to roofs, siding, and trees. 8/8/2018 2:57 PM EDT At 257 pm edt, a severe thunderstorm was located over westover hills, moving east at 30 mph (radar indicated). Hazards include 60 mph wind gusts and quarter size hail. Hail damage to vehicles is expected. expect wind damage to roofs, siding, and trees. locations impacted include, danville, eden, blairs, turbeville, and ingram. This includes the following location danville airport. 8/8/2018 2:54 PM EDT At 254 pm edt, a severe thunderstorm was located near camp springs, moving east at 35 mph (radar indicated). Hazards include 60 mph wind gusts and quarter size hail. Hail damage to vehicles is expected. expect wind damage to roofs, siding, and trees. Locations impacted include, eden, reidsville, wentworth, yanceyville, and bethel. 8/8/2018 2:43 PM EDT At 243 pm edt, a severe thunderstorm was located near cascade, moving east at 30 mph (radar indicated). Hazards include 60 mph wind gusts and quarter size hail. Hail damage to vehicles is expected. Expect wind damage to roofs, siding, and trees. 8/8/2018 2:37 PM EDT At 237 pm edt, a severe thunderstorm was located over reidsville, moving east at 35 mph (radar indicated). Hazards include 60 mph wind gusts and quarter size hail. Hail damage to vehicles is expected. expect wind damage to roofs, siding, and trees. Locations impacted include, eden, reidsville, wentworth, yanceyville, and bethel. 8/8/2018 2:17 PM EDT At 217 pm edt, a severe thunderstorm was located over intelligence, moving southeast at 35 mph (radar indicated). Hazards include 60 mph wind gusts and quarter size hail. Hail damage to vehicles is expected. Expect wind damage to roofs, siding, and trees. 8/3/2018 4:42 PM EDT At 442 pm edt, severe thunderstorms were located along a line extending from near bedford to leesville to near climax to near reidsville, moving northeast at 25 mph (radar indicated). Hazards include 60 mph wind gusts. Expect damage to roofs, siding, and trees. locations impacted include, lynchburg, danville, eden, reidsville, and bedford. This includes the following locations liberty university, the national d-day memorial, danville airport, and lynchburg airport. 7/22/2018 9:21 PM EDT The severe thunderstorm warning for northeastern stokes, rockingham and caswell counties will expire at 930 pm edt, the storms which prompted the warning have moved out of the area. therefore, the warning will be allowed to expire. when it is safe to do so, please send your reports of hail of any size, as well as reports of any wind damage, including downed trees or large limbs, to the national weather service by calling toll free at 1, 8 6 6, 2 1 5, 4 3 2 4. reports and pictures can also be shared on the national weather service blacksburg facebook page and on twitter. 7/22/2018 9:14 PM EDT At 914 pm edt, severe thunderstorms were located along a line extending from near yanceyville to near ayersville, moving north at 20 mph (radar indicated). Hazards include 60 mph wind gusts and quarter size hail. Hail damage to vehicles is expected. expect wind damage to roofs, siding, and trees. Locations impacted include, eden, reidsville, wentworth, mayodan, and madison. 7/22/2018 8:42 PM EDT At 841 pm edt, severe thunderstorms were located along a line extending from near camp springs to near pine hall, moving north at 25 mph (radar indicated). Hazards include 60 mph wind gusts and quarter size hail. Hail damage to vehicles is expected. expect wind damage to roofs, siding, and trees. Locations impacted include, eden, reidsville, wentworth, mayodan, and madison. 7/22/2018 8:15 PM EDT At 814 pm edt, severe thunderstorms were located along a line extending from elon college to near kernersville, moving north at 25 mph (radar indicated). Hazards include 60 mph wind gusts and quarter size hail. Hail damage to vehicles is expected. Expect wind damage to roofs, siding, and trees. 7/6/2018 3:10 PM EDT At 310 pm edt, a severe thunderstorm was located over oregon hill, moving south at 10 mph (radar indicated). Hazards include 60 mph wind gusts. Expect damage to roofs, siding, and trees. Locations impacted include, eden, reidsville, wentworth, mayfield, and oregon hill. 7/6/2018 2:49 PM EDT At 248 pm edt, a severe thunderstorm was located over draper, moving south at 5 mph (radar indicated). Hazards include 60 mph wind gusts and quarter size hail. Hail damage to vehicles is expected. Expect wind damage to roofs, siding, and trees. 5/10/2018 4:17 PM EDT At 416 pm edt, severe thunderstorms were located along a line extending from near virgilina to near prospect hill, moving east at 30 mph (radar indicated). Hazards include 60 mph wind gusts and quarter size hail. Hail damage to vehicles is expected. expect wind damage to roofs, siding, and trees. locations impacted include, danville, eden, reidsville, wentworth, and bethel. This includes the following location danville airport. 5/10/2018 4:05 PM EDT At 404 pm edt, severe thunderstorms were located along a line extending from cluster springs to baynes, moving east at 30 mph (radar indicated). Hazards include 60 mph wind gusts and quarter size hail. Hail damage to vehicles is expected. expect wind damage to roofs, siding, and trees. locations impacted include, danville, eden, reidsville, wentworth, and mayodan. This includes the following location danville airport. 5/10/2018 3:46 PM EDT At 345 pm edt, severe thunderstorms were located along a line extending from laurel park to meadows, moving east at 30 mph (radar indicated). Hazards include 60 mph wind gusts and quarter size hail. Hail damage to vehicles is expected. expect wind damage to roofs, siding, and trees. locations impacted include, danville, eden, reidsville, martinsville, and wentworth. This includes the following locations the martinsville speedway, martinsville airport, and danville airport. 5/10/2018 3:29 PM EDT At 329 pm edt, severe thunderstorms were located along a line extending from near collinsville to hanging rock state park, moving east at 30 mph (radar indicated). Hazards include 60 mph wind gusts and quarter size hail. Hail damage to vehicles is expected. Expect wind damage to roofs, siding, and trees. 4/15/2018 5:50 PM EDT At 530 pm edt, a confirmed tornado was located near monroeton, moving northeast at 40 mph (emergency management confirmed a tornado in guilford county, north carolina). Hazards include damaging tornado and quarter size hail. Flying debris will be dangerous to those caught without shelter. mobile homes will be damaged or destroyed. damage to roofs, windows, and vehicles will occur. tree damage is likely. Locations impacted include, eden, reidsville, wentworth, bethel, and providence. 4/15/2018 5:32 PM EDT At 532 pm edt, a severe thunderstorm was located over stoneville, moving northeast at 50 mph (radar indicated). Hazards include 60 mph wind gusts and quarter size hail. Hail damage to vehicles is expected. expect wind damage to roofs, siding, and trees. locations impacted include, eden, wentworth, mayodan, madison, and stoneville. A tornado watch remains in effect until 1100 pm edt for north central north carolina, and south central, southwestern and west central virginia. 4/15/2018 5:30 PM EDT At 530 pm edt, a confirmed tornado was located near monroeton, moving northeast at 40 mph (emergency management confirmed a tornado in guilford county, north carolina). Hazards include damaging tornado and quarter size hail. Flying debris will be dangerous to those caught without shelter. mobile homes will be damaged or destroyed. damage to roofs, windows, and vehicles will occur. tree damage is likely. Locations impacted include, eden, reidsville, wentworth, bethel, and providence. 4/15/2018 5:18 PM EDT At 517 pm edt, a tornado producing storm was located near mcleansville, moving northeast at 35 mph (emergency managers in guilford county reported a tornado on the ground). Hazards include damaging tornado and quarter size hail. Flying debris will be dangerous to those caught without shelter. mobile homes will be damaged or destroyed. damage to roofs, windows, and vehicles will occur. Tree damage is likely. 4/15/2018 5:18 PM EDT At 518 pm edt, a severe thunderstorm was located over pine hall, moving northeast at 65 mph (radar indicated). Hazards include 60 mph wind gusts and quarter size hail. Hail damage to vehicles is expected. Expect wind damage to roofs, siding, and trees. 3/17/2018 10:31 PM EDT At 1030 pm edt, severe thunderstorms were located along a line extending from near oregon hill to near reidsville, moving east at 30 mph. other strong to severe thunderstorms extended from stoneville to madison (radar indicated). Hazards include 60 mph wind gusts and quarter size hail. Hail damage to vehicles is expected. Expect wind damage to roofs, siding, and trees. 10/23/2017 7:41 PM EDT The tornado warning for eastern rockingham, northern caswell, pittsylvania, henry and southeastern franklin counties, the city of danville and the city of martinsville will expire at 745 pm edt, the storms which prompted the warning have weakened below severe limits, and no longer appear capable of producing a tornado. therefore the warning will be allowed to expire. however gusty winds are still possible with these thunderstorms. a tornado watch remains in effect until 900 pm edt for north central north carolina. a tornado watch also remains in effect until 200 am edt for south central, central, southwestern and west central virginia. when it is safe to do so, please send your reports of hail of any size, as well as reports of any wind damage, including downed trees or large limbs, to the national weather service by calling toll free at 1, 8 6 6, 2 1 5, 4 3 2 4. reports and pictures can also be shared on the national weather service blacksburg facebook page and on twitter. 10/23/2017 7:16 PM EDT At 716 pm edt, severe thunderstorms capable of producing a tornado were located along a line extending from near ferrum to near sandy level, moving southeast at 55 mph (radar indicated rotation). Hazards include tornado. Flying debris will be dangerous to those caught without shelter. mobile homes will be damaged or destroyed. damage to roofs, windows, and vehicles will occur. Tree damage is likely. 7/18/2017 7:37 PM EDT The severe thunderstorm warning for eastern rockingham, northern caswell, southern pittsylvania, southwestern halifax and southeastern henry counties and the city of danville will expire at 745 pm edt, the storm which prompted the warning has weakened below severe limits, and has exited the warned area. therefore, the warning will be allowed to expire. when it is safe to do so, please send your reports of hail of any size, as well as reports of any wind damage, including downed trees or large limbs, to the national weather service by calling toll free at 1, 8 6 6, 2 1 5, 4 3 2 4. reports and pictures can also be shared on the national weather service blacksburg facebook page and on twitter. 7/18/2017 7:19 PM EDT At 719 pm edt, a severe thunderstorm was located over westover hills, moving southwest at 25 mph (radar indicated). Hazards include 60 mph wind gusts and quarter size hail. Hail damage to vehicles is expected. expect wind damage to roofs, siding, and trees. Locations impacted include, danville, eden, reidsville, wentworth, and yanceyville. 7/18/2017 6:51 PM EDT At 651 pm edt, a severe thunderstorm was located near elmo, moving southwest at 30 mph (radar indicated). Hazards include 60 mph wind gusts and quarter size hail. Hail damage to vehicles is expected. Expect wind damage to roofs, siding, and trees. 7/8/2017 7:31 PM EDT At 731 pm edt, severe thunderstorms were located along a line extending from near mayfield to wentworth, moving east at 20 mph (radar indicated). Hazards include 60 mph wind gusts and quarter size hail. Hail damage to vehicles is expected. expect wind damage to roofs, siding, and trees. Locations impacted include, eden, reidsville, wentworth, madison, and camp springs. 7/8/2017 7:08 PM EDT At 708 pm edt, severe thunderstorms were located along a line extending from draper to near madison, moving southeast at 20 mph (radar indicated). Hazards include 60 mph wind gusts and quarter size hail. Hail damage to vehicles is expected. Expect wind damage to roofs, siding, and trees. 7/5/2017 9:10 PM EDT At 909 pm edt, severe thunderstorms were located along a line extending from near blanch through mayfield to near harrisons crossroads, moving southeast at 20 mph (radar indicated). Hazards include 60 mph wind gusts. Expect damage to roofs, siding, and trees. Locations impacted include, danville, eden, reidsville, wentworth, and yanceyville. 6/15/2017 9:05 PM EDT The severe thunderstorm warning for northwestern rockingham and south central henry counties will expire at 915 pm edt, the storm which prompted the warning has weakened below severe limits, and has exited the warned area. therefore, the warning will be allowed to expire. when it is safe to do so, please send your reports of hail of any size, as well as reports of any wind damage, including downed trees or large limbs, to the national weather service by calling toll free at 1, 8 6 6, 2 1 5, 4 3 2 4. reports and pictures can also be shared on the national weather service blacksburg facebook page and on twitter. 6/15/2017 8:54 PM EDT At 853 pm edt, a severe thunderstorm was located near price, moving northeast at 20 mph (radar indicated). Hazards include 60 mph wind gusts and quarter size hail. Hail damage to vehicles is expected. Expect wind damage to roofs, siding, and trees. 6/15/2017 8:23 PM EDT At 823 pm edt, a severe thunderstorm was located near price, moving northeast at 20 mph (radar indicated). Hazards include 60 mph wind gusts and quarter size hail. Hail damage to vehicles is expected. expect wind damage to roofs, siding, and trees. Locations impacted include, stoneville, and price. 6/15/2017 8:10 PM EDT At 810 pm edt, a severe thunderstorm was located over ayersville, moving east at 15 mph (radar indicated). Hazards include 60 mph wind gusts and quarter size hail. Hail damage to vehicles is expected. Expect wind damage to roofs, siding, and trees. 5/31/2017 7:06 PM EDT At 705 pm edt, a severe thunderstorm was located over intelligence, moving southeast at 25 mph (radar indicated). Hazards include ping pong ball size hail and 60 mph wind gusts. People and animals outdoors will be injured. expect hail damage to roofs, siding, windows, and vehicles. Expect wind damage to roofs, siding, and trees. 5/31/2017 6:46 PM EDT At 646 pm edt, severe thunderstorms were located along a line extending from near ayersville to near dillard to capella, moving east at 25 mph (radar indicated). Hazards include ping pong ball size hail and 60 mph wind gusts. People and animals outdoors will be injured. expect hail damage to roofs, siding, windows, and vehicles. expect wind damage to roofs, siding, and trees. Locations impacted include, eden, wentworth, mayodan, madison, and stoneville. 5/31/2017 6:34 PM EDT At 634 pm edt, severe thunderstorms were located along a line extending from near sandy ridge to near prestonville to near capella, moving east at 25 mph (radar indicated). Hazards include 60 mph wind gusts and quarter size hail. Hail damage to vehicles is expected. expect wind damage to roofs, siding, and trees. Locations impacted include, eden, wentworth, mayodan, madison, and walnut cove. 5/31/2017 6:10 PM EDT At 609 pm edt, severe thunderstorms were located along a line extending from near collinstown to near francisco to ararat, moving east at 25 mph (radar indicated). Hazards include 60 mph wind gusts and quarter size hail. Hail damage to vehicles is expected. Expect wind damage to roofs, siding, and trees. 5/11/2017 8:40 PM EDT The severe thunderstorm warning for eastern rockingham and western caswell counties will expire at 845 pm edt, the storm which prompted the warning has weakened below severe limits, and has exited the warned area. therefore, the warning will be allowed to expire at 845 pm. when it is safe to do so, please send your reports of hail of any size, as well as reports of any wind damage, including downed trees or large limbs, to the national weather service by calling toll free at 1, 8 6 6, 2 1 5, 4 3 2 4. reports and pictures can also be shared on the national weather service blacksburg facebook page and on twitter. 5/11/2017 8:12 PM EDT At 811 pm edt, a severe thunderstorm was located over wentworth, moving south at 20 mph (radar indicated). Hazards include 60 mph wind gusts and quarter size hail. Minor damage to vehicles is possible. expect wind damage to trees and power lines. Locations impacted include, eden, reidsville, wentworth, mayodan, and madison. 5/11/2017 8:09 PM EDT At 808 pm edt, a severe thunderstorm was located near camp springs, moving southeast at 40 mph (public. there have been multiple reports of trees downed in the towns of eden, draper and ruffin). Hazards include 60 mph wind gusts and quarter size hail. Minor damage to vehicles is possible. expect wind damage to trees and power lines. Locations impacted include, eden, reidsville, wentworth, yanceyville, and bethel. 5/11/2017 7:48 PM EDT At 746 pm edt, a severe thunderstorm was located over lawsonville, moving southeast at 40 mph (radar indicated. henry county warning point had reported multiple trees downed in southeastern henry county). Hazards include 60 mph wind gusts and quarter size hail. Minor damage to vehicles is possible. Expect wind damage to trees and power lines. 5/11/2017 7:38 PM EDT At 737 pm edt, a severe thunderstorm was located near eden, moving south at 20 mph (emergency management officials reported multiple trees downed and damage to transformers in southeastern henry county). Hazards include 60 mph wind gusts and quarter size hail. Minor damage to vehicles is possible. expect wind damage to trees and power lines. Locations impacted include, eden, reidsville, wentworth, mayodan, and madison. 5/11/2017 7:28 PM EDT At 727 pm edt, a severe thunderstorm was located near price, moving south at 20 mph (radar indicated). Hazards include 60 mph wind gusts and quarter size hail. Minor damage to vehicles is possible. Expect wind damage to trees and power lines. 5/5/2017 3:53 AM EDT At 352 am edt, a severe thunderstorm with a history of producing damaging winds was located over draper, moving northeast at 55 mph (trained weather spotters). Hazards include 60 mph wind gusts. Expect damage to trees and power lines. Locations impacted include, danville, eden, yanceyville, bethel, and chatham. 5/1/2017 7:27 PM EDT The severe thunderstorm warning for eastern rockingham, caswell, campbell, pittsylvania, southern bedford, south central amherst, and eastern henry counties, the city of danville and the city of lynchburg will expire at 730 pm edt, the storms which prompted the warning have moved out of the area. therefore the warning will be allowed to expire. however, a severe thunderstorm warning has been re-issued for eastern campbell, eastern pittsylvania, southeastern amherst and halifax counties in virginia and extreme southeastern caswell county in north carolina until 815 pm. a severe thunderstorm watch remains in effect until 1100 pm edt for north central north carolina, and central, south central and west central virginia. when it is safe to do so, please send your reports of hail of any size, as well as reports of any wind damage, including downed trees or large limbs, to the national weather service by calling toll free at 1, 8 6 6, 2 1 5, 4 3 2 4. reports and pictures can also be shared on the national weather service blacksburg facebook page and on twitter. 5/1/2017 6:53 PM EDT At 652 pm edt, severe thunderstorms were located along a line extending from near evington to near chatham to near camp springs, moving northeast at 45 mph (law enforcement). Hazards include 60 mph wind gusts and quarter size hail. Minor damage to vehicles is possible. expect wind damage to trees and power lines. Locations impacted include, lynchburg, danville, eden, reidsville, and bedford. 5/1/2017 6:25 PM EDT At 625 pm edt, severe thunderstorms were located along a line extending from near north shore to near sandy river to 7 miles north of greensboro, moving northeast at 45 mph (law enforcement). Hazards include 60 mph wind gusts and quarter size hail. Minor damage to vehicles is possible. Expect wind damage to trees and power lines. 9/28/2016 3:42 PM EDT At 341 pm edt, a severe thunderstorm was located over reidsville, moving northeast at 25 mph (radar indicated). Hazards include 60 mph wind gusts and quarter size hail. Hail damage to vehicles is expected. expect wind damage to roofs, siding, and trees. Locations impacted include, eden, reidsville, wentworth, mayfield, and lawsonville. 9/28/2016 3:26 PM EDT At 324 pm edt, a severe thunderstorm was located over monroeton, moving northeast at 25 mph. another severe thunderstorm was located between harrisons crossroads and reidsville, also moving northeast at 25 mph (radar indicated). Hazards include 60 mph wind gusts and quarter size hail. Hail damage to vehicles is expected. expect wind damage to roofs, siding, and trees. Locations impacted include, eden, reidsville, wentworth, mayodan, and madison. 9/28/2016 2:54 PM EDT At 254 pm edt, a severe thunderstorm was located 8 miles south of ellisboro, moving northeast at 25 mph (radar indicated). Hazards include 60 mph wind gusts and quarter size hail. Hail damage to vehicles is expected. Expect wind damage to roofs, siding, and trees. 9/28/2016 2:26 PM EDT At 226 pm edt, a severe thunderstorm was located over oregon hill, moving east at 20 mph (radar indicated). Hazards include 60 mph wind gusts and quarter size hail. Hail damage to vehicles is expected. Expect wind damage to roofs, siding, and trees. 8/17/2016 4:08 PM EDT At 406 pm edt, severe thunderstorms were located along a line extending from snow creek to near stoneville, moving east at 25 mph (radar indicated). Hazards include 60 mph wind gusts and quarter size hail. Hail damage to vehicles is expected. expect wind damage to roofs, siding, and trees. locations impacted include, eden, martinsville, axton, callands, and spencer. This includes the following locations the martinsville speedway and martinsville airport. 8/17/2016 3:43 PM EDT At 343 pm edt, severe thunderstorms were located along a line extending from near oak level to prestonville, moving east at 25 mph (radar indicated). Hazards include 60 mph wind gusts and quarter size hail. Hail damage to vehicles is expected. Expect wind damage to roofs, siding, and trees. 7/15/2016 5:27 PM EDT At 526 pm edt, a severe thunderstorm was located near intelligence, moving east at 20 mph (radar indicated). Hazards include 60 mph wind gusts. Expect damage to roofs. siding. and trees. Locations impacted include, eden, reidsville, wentworth, mayodan, and madison. 7/15/2016 5:10 PM EDT At 510 pm edt, a severe thunderstorm was located over stoneville, moving east at 30 mph (radar indicated). Hazards include 60 mph wind gusts. Expect damage to roofs. siding. and trees. Locations impacted include, eden, reidsville, wentworth, mayodan, and madison. 7/15/2016 4:45 PM EDT At 445 pm edt, a severe thunderstorm was located over prestonville, moving east at 30 mph (radar indicated). Hazards include 60 mph wind gusts. Expect damage to roofs. siding. And trees. 7/3/2016 1:05 AM EDT At 105 am edt, severe thunderstorms were located along a line extending from blanch to harrisons crossroads, moving southeast at 10 mph (radar indicated). Hazards include 60 mph wind gusts. Expect damage to roofs. siding. and trees. Locations impacted include, eden, reidsville, yanceyville, bethel, and camp springs. 7/3/2016 12:32 AM EDT At 1231 am edt, severe thunderstorms were located along a line extending from near blairs to near mayfield, moving southeast at 20 mph (radar indicated). Hazards include 60 mph wind gusts. Expect damage to roofs. siding. And trees. 7/3/2016 12:20 AM EDT At 1218 am edt, severe thunderstorms were located along a line extending from near turbeville to gatewood to eden, moving east at 50 mph (radar indicated). Hazards include 60 mph wind gusts. Expect damage to roofs. siding. and trees. locations impacted include, danville, eden, martinsville, mayodan, and madison. this includes the following locations the martinsville speedway, martinsville airport, and danville airport. Wind gusts to 60 mph, frequent cloud-to-ground lightning, and torrential rainfall area likely in the danville city area during the next 30 minutes. 7/2/2016 11:47 PM EDT At 1147 pm edt, severe thunderstorms were located along a line extending from near dry fork to near price to near patrick springs, moving east-southeast at 50 mph (radar indicated). Hazards include 60 mph wind gusts. Expect damage to roofs. siding. And trees. 7/1/2016 2:36 AM EDT The severe thunderstorm warning for eastern rockingham, southwestern pittsylvania and southeastern henry counties will expire at 245 am edt, the storms which prompted the warning have weakened below severe limits, and have exited the warned area. therefore the warning will be allowed to expire. 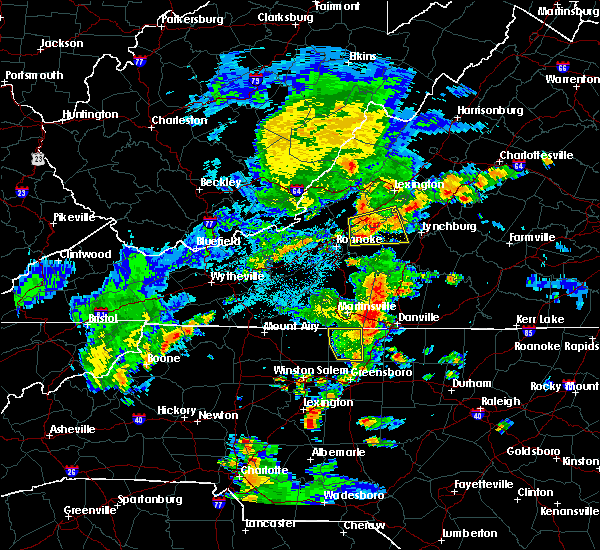 however heavy rain is still possible with these thunderstorms along with occasional cloud-to-ground lightning. 7/1/2016 2:23 AM EDT At 222 am edt, severe thunderstorms were located along a line extending from near draper to near camp springs, moving northeast at 25 mph (radar indicated). Hazards include 60 mph wind gusts. Expect damage to roofs. siding. and trees. Locations impacted include, eden, reidsville, wentworth, mayfield, and ruffin. 7/1/2016 1:47 AM EDT At 146 am edt, severe thunderstorms were located along a line extending from spencer to near monroeton, moving northeast at 10 mph (radar indicated). Hazards include 60 mph wind gusts. Expect damage to roofs. siding. And trees. 6/29/2016 5:19 PM EDT At 519 pm edt, a severe thunderstorm was located over oregon hill, moving east at 25 mph (radar indicated). Hazards include 60 mph wind gusts and penny size hail. Expect damage to roofs. siding. and trees. Locations impacted include, eden, reidsville, wentworth, mayfield, and lawsonville. 6/29/2016 5:09 PM EDT At 508 pm edt, a severe thunderstorm was located over harrisons crossroads, moving east at 30 mph (radar indicated). Hazards include 60 mph wind gusts and penny size hail. Expect damage to roofs. siding. and trees. Locations impacted include, eden, reidsville, wentworth, mayfield, and lawsonville. 6/29/2016 5:00 PM EDT At 459 pm edt, a severe thunderstorm was located over eden, moving east at 25 mph (radar indicated). Hazards include 60 mph wind gusts and penny size hail. Expect damage to roofs. siding. and trees. Locations impacted include, eden, reidsville, wentworth, stoneville, and mayfield. 6/29/2016 4:35 PM EDT At 435 pm edt, a severe thunderstorm was located over ayersville, moving east at 25 mph (radar indicated). Hazards include 60 mph wind gusts and quarter size hail. Hail damage to vehicles is expected. Expect wind damage to roofs, siding, and trees. 6/24/2016 10:40 PM EDT The severe thunderstorm warning for caswell and eastern rockingham counties will expire at 1045 pm edt, the storms which prompted the warning have weakened. therefore the warning will be allowed to expire. moderate to heavy rainfall and frequent cloud-to-ground lightning will continue in this area for another 30 minutes or so. when it is safe to do so, please send your reports of hail of any size, as well as any reports of wind damage, including downed trees or large limbs, to the national weather service by calling toll free at 1, 8 6 6, 2 1 5, 4 3 2 4. reports and pictures can also be shared on the national weather service blacksburg facebook page and on twitter. 6/24/2016 10:29 PM EDT At 1027 pm edt, severe thunderstorms were located along a line extending from lawsonville to near hightowers to near leasburg, moving southeast at 25 mph (radar indicated). Hazards include 60 mph wind gusts. Expect damage to roofs. siding. and trees. Locations impacted include, eden, reidsville, yanceyville, bethel, and camp springs. 6/24/2016 10:11 PM EDT At 1010 pm edt, severe thunderstorms were located along a line extending from draper to yanceyville to semora, moving southeast at 25 mph (radar indicated). Hazards include 60 mph wind gusts. Expect damage to roofs. siding. and trees. locations impacted include, danville, eden, reidsville, yanceyville, and bethel. This includes danville airport. 6/24/2016 9:49 PM EDT At 947 pm edt, severe thunderstorms were located along a line extending from near aiken summit to gatewood to near ringgold, moving southeast at 25 mph. another severe thunderstorm was located near reidsville, almost moving southeast at 25 mph (radar indicated). Hazards include 60 mph wind gusts. Expect damage to roofs. siding. and trees. locations impacted include, danville, eden, reidsville, yanceyville, and bethel. This includes danville airport. 6/24/2016 9:38 PM EDT At 937 pm edt, severe thunderstorms were located along a line extending from laurel park to near westover hills to near keeling, moving southeast at 25 mph (radar indicated). Hazards include 60 mph wind gusts. Expect damage to roofs. siding. And trees. 6/22/2016 4:11 PM EDT At 411 pm edt, a severe thunderstorm was located near cascade, moving southeast at 35 mph (radar indicated). Hazards include 60 mph wind gusts and quarter size hail. Hail damage to vehicles is expected. Expect wind damage to roofs, siding, and trees. 6/15/2016 8:21 PM EDT At 819 pm edt, a severe thunderstorm was located over draper, moving east at 20 mph (radar indicated). Hazards include 60 mph wind gusts and quarter size hail. Hail damage to vehicles is expected. expect wind damage to roofs, siding, and trees. Locations impacted include, eden, mayfield, cascade, draper, and aiken summit. 6/15/2016 8:01 PM EDT At 801 pm edt, a severe thunderstorm was located over sandy level, moving east at 15 mph (radar indicated). Hazards include 60 mph wind gusts and quarter size hail. Hail damage to vehicles is expected. Expect wind damage to roofs, siding, and trees. 6/5/2016 6:00 PM EDT At 600 pm edt, severe thunderstorms were located along a line extending from mayfield to lawsonville to near reidsville, moving east at 50 mph (radar indicated). Hazards include 60 mph wind gusts. Expect damage to roofs. siding. and trees. Locations impacted include, eden, reidsville, wentworth, mayfield, and lawsonville. 6/5/2016 5:50 PM EDT At 550 pm edt, severe thunderstorms were located along a line extending from eden to near wentworth to near monroeton, moving east at 55 mph (radar indicated). Hazards include 60 mph wind gusts. Expect damage to roofs. siding. And trees. 6/4/2016 9:33 PM EDT At 933 pm edt, severe thunderstorms were located along a line extending from near pittsville to near harrisons crossroads, moving east at 20 mph (radar indicated). Hazards include 60 mph wind gusts. Expect damage to roofs. siding. And trees. 6/4/2016 9:16 PM EDT At 914 pm edt, a severe thunderstorm was located over mayodan, moving northeast at 25 mph (radar indicated). Hazards include 60 mph wind gusts and quarter size hail. Hail damage to vehicles is expected. expect wind damage to roofs, siding, and trees. Locations impacted include, eden, reidsville, wentworth, mayodan, and madison. 6/4/2016 8:47 PM EDT At 846 pm edt, a severe thunderstorm was located over pine hall, moving northeast at 20 mph (radar indicated). Hazards include 60 mph wind gusts and quarter size hail. Hail damage to vehicles is expected. Expect wind damage to roofs, siding, and trees. 5/3/2016 6:27 PM EDT The severe thunderstorm warning for northeastern rockingham and southwestern pittsylvania counties will expire at 630 pm edt, the storm which prompted the warning has weakened below severe limits, and has exited the warned area. therefore the warning will be allowed to expire. however small hail, gusty winds and heavy rain are still possible with this thunderstorm. when it is safe to do so, please send your reports of hail of any size, as well as any reports of wind damage, including downed trees or large limbs, to the national weather service by calling toll free at 1, 8 6 6, 2 1 5, 4 3 2 4. reports and pictures can also be shared on the national weather service blacksburg facebook page and on twitter. 5/3/2016 6:13 PM EDT At 612 pm edt, a severe thunderstorm was located near mayfield, moving east at 25 mph (radar indicated). Hazards include 60 mph wind gusts and quarter size hail. Hail damage to vehicles is expected. expect wind damage to roofs, siding, and trees. Locations impacted include, eden, mayfield, ruffin, cascade, and oregon hill. 5/3/2016 5:52 PM EDT At 552 pm edt, a severe thunderstorm was located over sandy level, moving east at 25 mph (radar indicated). Hazards include 60 mph wind gusts and quarter size hail. Hail damage to vehicles is expected. expect wind damage to roofs, siding, and trees. Locations impacted include, eden, mayfield, ruffin, aiken summit, and cascade. 5/3/2016 5:39 PM EDT At 539 pm edt, a severe thunderstorm was located near sandy level, moving east at 25 mph (radar indicated). Hazards include 70 mph wind gusts and half dollar size hail. Hail damage to vehicles is expected. expect considerable tree damage. Wind damage is also likely to mobile homes, roofs, and outbuildings. 5/2/2016 5:49 PM EDT At 548 pm edt, a severe thunderstorm was located near collinstown, moving northeast at 30 mph (radar indicated). Hazards include 60 mph wind gusts and half dollar size hail. Hail damage to vehicles is expected. Expect wind damage to roofs, siding, and trees. 2/24/2016 2:57 PM EST The severe thunderstorm warning for western caswell, eastern rockingham and southwestern pittsylvania counties will expire at 300 pm est, the storms which prompted the warning have moved out of the area. therefore the warning will be allowed to expire. a tornado watch remains in effect until 700 pm est for north central north carolina. a tornado watch also remains in effect until 900 pm est for south central virginia. when it is safe to do so, please send your reports of hail of any size, as well as any reports of wind damage, including downed trees or large limbs, to the national weather service by calling toll free at 1, 8 6 6, 2 1 5, 4 3 2 4. reports and pictures can also be shared on the national weather service blacksburg facebook page and on twitter. 2/24/2016 2:45 PM EST At 243 pm est, severe thunderstorms were located along a line extending from near westover hills to near lawsonville, moving northeast at 50 mph (radar indicated). Hazards include 60 mph wind gusts. Expect damage to roofs. siding. and trees. locations impacted include, eden, reidsville, wentworth, camp springs, and mayfield. a tornado watch remains in effect until 700 pm est for north central north carolina. 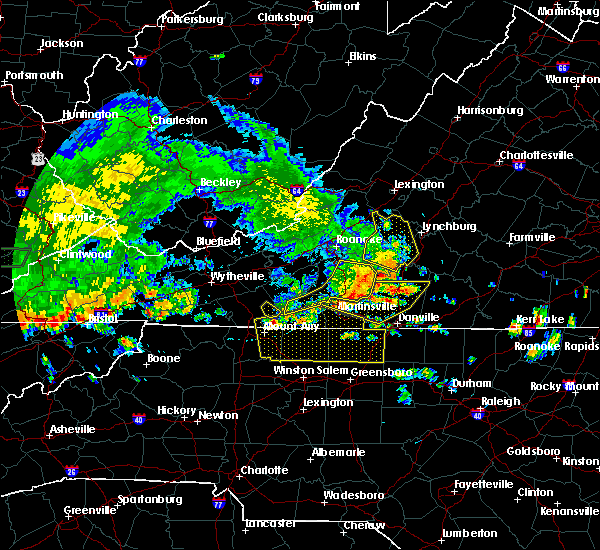 A tornado watch also remains in effect until 900 pm est for south central virginia. 2/24/2016 2:30 PM EST At 229 pm est, severe thunderstorms were located along a line extending from near draper to near monroeton, moving northeast at 40 mph (radar indicated). Hazards include 60 mph wind gusts. Expect damage to roofs. siding. and trees. locations impacted include, eden, reidsville, wentworth, camp springs, and mayfield. a tornado watch remains in effect until 700 pm est for north central north carolina. A tornado watch also remains in effect until 900 pm est for south central virginia. 2/24/2016 2:26 PM EST At 226 pm est, a severe thunderstorm was located over cascade, moving east at 35 mph (radar indicated). Hazards include 60 mph wind gusts and quarter size hail. Hail damage to vehicles is expected. Expect wind damage to roofs, siding, and trees. 2/24/2016 2:06 PM EST At 205 pm est, a severe thunderstorm was located over collinsville, moving northeast at 30 mph (radar indicated). Hazards include 60 mph wind gusts and quarter size hail. Hail damage to vehicles is expected. expect wind damage to roofs, siding, and trees. locations impacted include, eden, martinsville, rocky mount, martinsville city, and axton. this includes the martinsville speedway and martinsville airport. a tornado watch remains in effect until 700 pm est for north central north carolina. A tornado watch also remains in effect until 900 pm est for south central virginia. 2/24/2016 1:55 PM EST At 154 pm est, severe thunderstorms were located along a line extending from near belews lake to near high point, moving northeast at 40 mph (radar indicated). Hazards include 60 mph wind gusts. Expect damage to roofs. siding. And trees. 2/24/2016 1:48 PM EST At 148 pm est, a severe thunderstorm was located near bassett, moving northeast at 55 mph (radar indicated). Hazards include 60 mph wind gusts and quarter size hail. Hail damage to vehicles is expected. expect wind damage to roofs, siding, and trees. locations impacted include, eden, martinsville, rocky mount, martinsville city, and axton. this includes the martinsville speedway and martinsville airport. a tornado watch remains in effect until 700 pm est for north central north carolina. A tornado watch also remains in effect until 900 pm est for south central virginia. 2/24/2016 1:37 PM EST At 136 pm est, a severe thunderstorm was located near penns store, moving northeast at 55 mph (radar indicated). Hazards include 60 mph wind gusts and quarter size hail. Hail damage to vehicles is expected. Expect wind damage to roofs, siding, and trees. 9/12/2015 3:20 AM EDT At 319 am edt, severe thunderstorms were located along a line extending from axton to near cascade to near draper, moving northeast at 35 mph (radar indicated). Hazards include 60 mph wind gusts and quarter size hail. Hail damage to vehicles is expected. Expect wind damage to roofs, siding and trees. 9/12/2015 3:09 AM EDT At 308 am edt, severe thunderstorms were located along a line extending from near sandy level to draper to near eden, moving northeast at 35 mph (radar indicated). Hazards include 60 mph wind gusts and half dollar size hail. Hail damage to vehicles is expected. expect wind damage to roofs, siding and trees. Locations impacted include, eden, and sandy level. 9/12/2015 2:58 AM EDT At 258 am edt, a severe thunderstorm was located near price, moving northeast at 30 mph (radar indicated). Hazards include half dollar size hail. Damage to vehicles is expected. Locations impacted include, eden, wentworth, stoneville, and sandy level. 8/11/2015 5:02 PM EDT At 501 pm edt, a severe thunderstorm was located over eden, moving southeast at 30 mph (radar indicated). Hazards include 60 mph wind gusts and quarter size hail. Hail damage to vehicles is expected. expect wind damage to roofs, siding and trees. locations impacted include, danville, eden, wentworth, mayodan, and madison. This includes danville airport. 8/11/2015 4:28 PM EDT At 427 pm edt, a severe thunderstorm was located near martinsville airport, moving southeast at 15 mph (radar indicated). Hazards include 60 mph wind gusts and quarter size hail. Hail damage to vehicles is expected. expect wind damage to roofs, siding and trees. locations impacted include, danville, eden, martinsville, wentworth, and mayodan. This includes the following locations the martinsville speedway, martinsville airport, and danville airport. 8/11/2015 4:12 PM EDT At 412 pm edt, a severe thunderstorm was located over martinsville airport, moving southeast at 10 mph (radar indicated). Hazards include 60 mph wind gusts and quarter size hail. Hail damage to vehicles is expected. Expect wind damage to roofs, siding and trees. 7/13/2015 8:26 PM EDT At 825 pm edt, severe thunderstorms were located along a line extending from near cascade to 6 miles southeast of belews lake, moving southeast at 65 mph (radar indicated). Hazards include 60 mph wind gusts and quarter size hail. Hail damage to vehicles is expected. Expect wind damage to roofs, siding and trees. 7/5/2015 3:12 PM EDT At 312 pm edt, a severe thunderstorm was located over pelham, moving north at 15 mph (radar indicated). Hazards include 60 mph wind gusts. Expect damage to roofs. siding and trees. locations impacted include, danville city, mayfield, and pelham. This includes danville airport. 7/5/2015 2:50 PM EDT At 250 pm edt, a severe thunderstorm was located over mayfield, moving northeast at 10 mph (radar indicated). Hazards include 60 mph wind gusts and quarter size hail. Hail damage to vehicles is expected. Expect wind damage to roofs, siding and trees. 6/27/2015 7:52 PM EDT At 751 pm edt, severe thunderstorms were located along a line extending from near climax to mayfield, moving east at 30 mph (radar indicated). Hazards include 60 mph wind gusts and quarter size hail. Hail damage to vehicles is expected. expect considerable tree damage. wind damage is also likely to mobile homes, roofs and outbuildings. locations impacted include, danville, eden, bethel, blairs, and mayfield. This includes danville airport. 6/27/2015 7:32 PM EDT At 731 pm edt, severe thunderstorms were located along a line extending from callands to eden, moving east at 30 mph (radar indicated). Hazards include 70 mph wind gusts and quarter size hail. Hail damage to vehicles is expected. expect considerable tree damage. Wind damage is also likely to mobile homes, roofs and outbuildings. 5/31/2015 8:41 PM EDT At 840 pm edt, severe thunderstorms were located along a line extending from near cascade to reidsville, moving northeast at 15 mph (radar indicated). Hazards include 60 mph wind gusts. Expect damage to roofs. Siding and trees. 5/11/2015 9:27 PM EDT The severe thunderstorm warning for western rockingham county will expire at 930 pm edt, the storms which prompted the warning have moved into eastern rockingham county and weakened. therefore the warning will be allowed to expire. however small hail, gusty winds and heavy rain are still possible with these thunderstorms, along with frequent cloud-to-ground lightning. when it is safe to do so, please send your reports of hail of any size, as well as any reports of wind damage, including downed trees or large limbs, to the national weather service by calling toll free at 1, 8 6 6, 2 1 5, 4 3 2 4. reports and pictures can also be shared on the national weather service blacksburg facebook page and on twitter. 5/11/2015 9:07 PM EDT At 906 pm edt, severe thunderstorms were located along a line extending from near spencer to near ellisboro, moving east at 20 mph (radar indicated). Hazards include 60 mph wind gusts and quarter size hail. Hail damage to vehicles is expected. expect wind damage to roofs, siding and trees. locations impacted include, eden, wentworth, mayodan, madison, and stoneville. 1. 00in. 5/11/2015 8:35 PM EDT At 835 pm edt, severe thunderstorms were located along a line extending from near sandy ridge to near walnut cove, moving east at 20 mph (radar indicated). Hazards include 60 mph wind gusts and quarter size hail. Hail damage to vehicles is expected. Expect wind damage to roofs, siding and trees. 4/20/2015 3:43 PM EDT The national weather service in blacksburg has issued a * severe thunderstorm warning for. 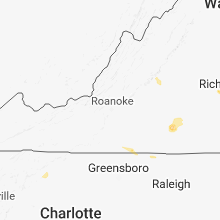 north central rockingham county in north central north carolina. 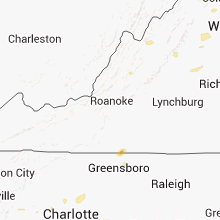 central pittsylvania county in south central virginia. southeastern henry county in south central virginia. West central halifax county in south central virginia. 4/20/2015 3:19 PM EDT At 318 pm edt, a severe thunderstorm was located near bethany, moving northeast at 30 mph (radar indicated). Hazards include 60 mph wind gusts and quarter size hail. Hail damage to vehicles is expected. Expect wind damage to roofs, siding and trees. 6/11/2014 7:15 PM EDT Quarter sized hail reported 1.1 miles NNE of Eden, NC, valley drive. also 1 tree down on the golf course. 6/12/2013 5:30 PM EDT Quarter sized hail reported 4.1 miles NNE of Eden, NC, quarter size hail was reported along redbud road.